We went to visit our vet today. 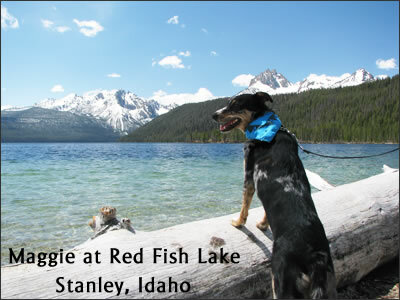 Don’t worry Maggie wasn’t sick – it was her annual checkup at her favorite Boise veterinarian – Dr. McKown. Before we went into the exam room we were excited to visit their new shop. Pets First Animal Clinic expanded their clinic and added a cute shop of elite pet products. I asked Dr. McKown to tell me more about their new shop. Spoil that pet of yours at Elite Foods and Apparel; We carry a full line of hard to find items such as LED Collars, outdoors gear, ecofriendly clothes, bowls, and gifts; High quality leather collars and leashes, bamboo leashes and collars; a full line of specialty foods including Canidae, Felidae, Natural Balance, Evo, Innova, Ivet, Taste of the Wild, Blue Buffalo, Premium Edge, Wellness and many more. We also carry enormous Elk antlers, bully sticks, treats, tough-to-destroy toys, enameled dog and cat treasure boxes, and much more. We carry a full line of BSU, Vandals, and Packer gear for you pet as well! Open Saturdays AND Sundays!!! Pets First Elite Foods and Apparel is having their Grand Opening this weekend, May 5th, 2012. Pets First Animal Clinic is located at 9730 Fairview Ave Boise, ID. (ARA) – When the warm summer months roll around, our dogs are just as eager as we are to get outside and enjoy the season. Whether he tells you by nudging his leash or staring at the door knob, one way or another, your pup knows it’s time for some fun in the sun. While you’re there, ask your veterinarian to evaluate your pet’s overall health. Your veterinarian’s office is also a great place to pick up two essential medications for the season – heartworm preventers and flea and tick control. 2. Run free. It’s easy for humans and canines alike to slide out of shape during the winter months, and now is the perfect time to work off what you’ve packed on. Taking your dog on regular walks will help, but even more fun for him is a trip to the dog park. Off-leash areas are a treasure for pets and their owners because dogs can run free and play to their heart’s content. They also get natural lessons in socialization. In fact, 44 percent of dog owners who take their dog to the dog park say their dog is more social with other people and dogs. Plus, it’s fun for you, too! Because pet owners value off-leash areas so much, dog parks across the country are expanding and improving now more than ever. Here in Boise we are hoping to have more access to off leash dog parks. Boise City encourages volunteers, as well as funding. Find Dog Off Leash Areas on the City of Boise Website. 3. Be prepared. Dogs aren’t much for strolling around the mall. They love to be out running around and often don’t want to stop no matter how warm it is or tired they feel. Brush up on the signs and symptoms of health problems like dehydration and heat stroke, as well as basic first aid techniques. 4. Good on the inside. To keep your pet’s energy and health at optimal levels for increased summer activity, be sure you feed a high-quality dog food. It’s easier than ever to make sure your dog is getting complete, healthy nutrition without fillers. High quality foods can be found at your pet store and come in a variety of options that cater to your pet’s size or life stage. Whether you’re going on a weekend camping trip with your four-legged friend or just heading out for a romp at the dog park, a safe summer is the happiest kind of summer there is. What do you think of when I say BIG BLUE? If you live in Boise Idaho, you think of Boise State University Broncos and their big blue football field. What do you think of when I say MEN IN BLUE? OK, some of the more creative theatrically adept among us might think of the BLUE MAN GROUP, a totally unique form of entertainment that combines theatrical performance of music, comedy and multimedia. But most will agree the term "Men in Blue" represents those who put their lives on the line to serve and protect the fine citizens of our much-loved metropolis – our local Boise Police Department. In Boise we have police officers serving the community in many specialties: Airport Police; School Resource Officers; Police Patrol Units; Officers who ride motorcycles; Uniformed Police Officers on bicycles, assisted by a few part-time Rangers and many volunteer patrols riding golf carts patrolling the Boise River Greenbelt. But, the DogBlog has chosen to focus on one Boise police program in particular. Many of the dog-friendly respectable citizens of the "City of Trees" truly appreciate, what our DogBlog considers the true blue officers of the Boise Police Department, the loyal and courageous Canine Officers in the Boise PD K9 Unit. According to the Boise PD the canine/handler teams began their service as an official Boise Canine Unit in 1996. These heroic dogs receive extensive training to fulfill their responsibilities as valuable members of our community. Because of their acute sense of smell, they are extremely proficient in detecting hidden drugs, tracking, locating and apprehending suspects, as well as sniffing out articles the bad guys have left behind. Working as a police officer can be a stressful career. This is also true for canine officers, so it’s good to hear that the dogs are well taken care of. In fact, all of the canines reside in a residence with their handler and become a part of that officer’s family, socializing with others and recovering from the stress of serving and protecting in the line of duty. A recent visit to the Boise PD Facebook Page reveals the newest additions to the pack. Meet Bosco, KC and Kamo, Boise PD’s newest drug detection dogs! The Boise Police Canine Unit is proud to introduce it’s 3 newest members, Bosco, KC and Kamo. All 3 dogs were awarded their certification this past week from the Idaho Peace Officers Standards and Training Academy, achieving the required 100% accuracy on the patrol dog drug detection tests. The Boise Police Canine Foundation is hoping to acquire the funds to purchase a dual-purpose drug detection – suspect apprehension dog likely sometime within the next year to replace a dog expected to retire. The cost of these incredibly specialized dogs is between $8,000 and $9,000. To contribute to the Boise Police Canine Foundation, log onto www.boisepolice.org. Donations are tax deductible and very much appreciated! READ MORE about these valuable members of Boise PD K-9 Unit on their Facebook Page. Boise PD YouTube Channel has an introduction demonstration to the K-9 Unit. You can see they really know their stuff! The Boise Police Department is not allowed to accept donations. However, we now have the opportunity to support this very special team of dogs. The Boise Police Department, in partnership with the Idaho Community Foundation has formed the Boise Police Canine Foundation. By partnering with the Idaho Community Foundation, the Boise Police Department can accept contributions toward purchasing new police dogs and supporting its existing dogs. K-9 Foundation – See their link to make an online donation, or donate via snail mail. 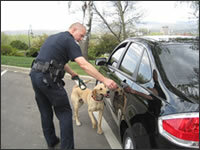 Boise PD K-9 Unit – See their link to sign up for the Boise PD K-9 Newsletter. Find Boise PD on Facebook. Follow Boise PD on Twitter. Maggie, the DogBlog Dog from Boise, Idaho was pleased to test out a very special bed. Special, you say, what makes this pet bed so special? First of all, it is so comfortable it feels like an air mattress. She snoozes away, dreaming of squirrels up a tree and running like the wind. Maggie is a dog who thought the master family bed was the only place she could sleep. This was until we got her this new luxury pet bed from Crypton Super Fabrics. Now she can stretch out and feel snug as a bug in a rug. OK, she might need a few toys to really feel snug, but even humans would enjoy sleeping on this bed. The other advantages: Crypton says “if you have a messy pet, don’t stress”. Crypton Super Fabrics makes their machine-washable pet beds resistant to moisture, stains, odors and bacteria. Their impenetrable barrier keeps grime from soaking through the fabric. Pet accident? No problem – just wipe away. For stubborn stains, they offer a complete Pet Stain and Odor Remover System. But the DogBlog hasn’t tested those products. You can visit Crypton Super Fabrics online to create a customized bed for your pet, and view their blog – lifeoncrypton.com/blog – to find out about Life on Crypton and the Super Pooch, Molly B. Please check out Maggie’s musical YouTube video review. Maggie and the DogBlog give Crypton Super Fabrics Pet Beds a WINNER Recommendation. This pet bed product is the best dog bed we have experienced. Read more about Maggie, our family dog, rescued from a shelter, trained by prison inmates and now the best dog in the world (in our humble opinion). Why we started our DogBlog – a sad story about losing our best friend and finding a new one.